22 year old Alyz Henrich, Miss Venezuela, defeated 87 other delegates to be crowned Miss Earth 2013 at the Versailles Palace close to Manila earlier tonight. 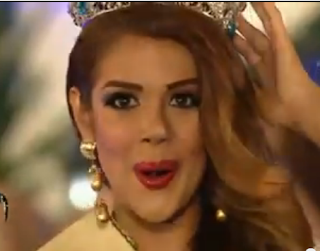 The 1.76m beauty is her country's second Miss Earth. Venezuela also won in 2005. Miss Austria, Katia Wagner, was crowned Miss Earth Air while Miss Earth Thailand, Punika Kulsoontornrut, was named Miss Earth Water. Catharina Choi, Miss Korea, was crowned Miss Earth Fire. The delegates from Mexico, the Philippines, Poland, and Serbia completed the top 8. Misses Chile, China, France, Mauritius, South Africa, Spain, Turkey, and the USA completed the top 16.